BOSTON - Sophomore Veronika Pettey notched her first collegiate hat trick and junior Andrea Renner added two goals to propel the No. 3 Northeastern women's hockey team to a weekend sweep of Vermont in a 5-1 victory on Saturday at Matthews Arena. Five different Huskies notched multi-point efforts in the game, including a three-assist performance from junior Matti Hartman (her first collegiate three-point game) and two assists each for sophomores Brooke Hobson and Skylar Fontaine. 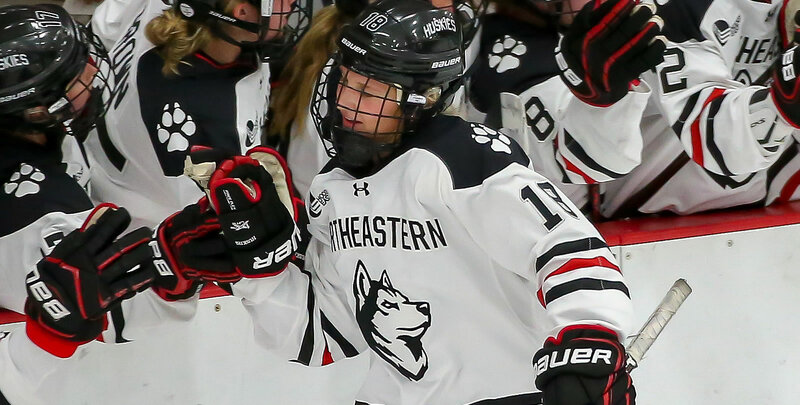 With the victory, Northeastern (19-3-3, 17-2-2 WHEA) matched its win total from all of last season and improved to 10-0-0 at home against Hockey East opponents in 2018-19. Renner got the Huskies started with a wrap-around finish at 8:31 of the first period, before adding a second goal at 11:04 of the second stanza to break a 1-1 tie and put the hosts ahead for good. The eventual game-winning goal gave Renner her first collegiate multi-goal game. Pettey took over from there, recording a natural hat trick to round out the scoring. Her first goal came at 14:10 of the second period as the Potomac, Maryland native roofed a wrister from the low slot following a pretty feed from Hartman. Pettey struck again at 19:12 of the middle frame, taking a feed from Fontaine and waiting out UVM netminder Melissa Black (31 saves), before slipping a shot through the five-hole to make it 4-1. With 3:45 remaining in regulation, Pettey completed the hat trick, poking home a loose puck in the crease following a point-shot from Hobson. Sophomore Aerin Frankel held the fort defensively with 17 saves to improve to 14-1-1 overall and 13-0-0 in WHEA play. The Huskies will look to stay hot next weekend when NU travels to UConn on Friday, Feb. 1 for a 6 p.m. puck drop.